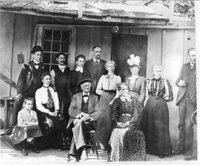 I have been enjoying the Pescadero Memories website. Omar N. Steele (my g-grandfather) along with wife Harriet and daughter Nellie moved to the area between 1865 & 1870. 1870 census shows Omar owning a sawmill, and living in the Steele sawmill boardinghouse in Santa Cruz. Before 1874 he and his family moved back to Ohio. The census is the only record I have of Omar being in California. California. Do you have any info on that? Thank you for the email. I have never heard of Omar Steele. Very interesting. I think I mentioned how the Steeles got to California from Ohio–I’ll have to go back and check and let you know. Another source where you might look is the San Mateo County History Museum in Redwood City. They have archives, Carol is the librarian there. The number if 650.299.0104. My information comes from old newspapers, some interviews as well as the history museum, which is one of, if not, THE BEST, local history museum in California. I met some of the Steeles years ago when they were still living on their beach=side property at Ano Nuevo.on the San Mateo County Coastside. It was around the time that the State of California was “buying up” beach property for public access. There are Steeles living in Pescadero today. Are you in contact with them? Thank you for your speedy reply. I don’t mind if you post my email. I am not in contact with any of the Steeles. I did know and met Myrtle Garavanta in Davenport, CA. Here is what I can tell you about Omar, if you are interested. He was born in Amherst, Ohio; Sept 15, 1843. After the Civil War, Omar, his wife Harriet Roselle Crocker and their 4 yr old daughter sailed from NY, crossed Panama by train and sailed to San Francisco to join his parents, Samuel Horace Steele & Amanda, along with Omar’s cousins in California. In 1870 Omar was listed as the owner of the Steele Saw Mill in Santa Cruz and they had about 18 people living with them in the Steele Sawmill Boardinghouse. We understand that Omar may have lost some fingers in a sawmill accident, and I suspect Harriet was homesick for her family in Ohio. Before 1874, they retraced their route back to Cleveland Ohio. Omar’s second daughter, my grandmother, Mary Amanda Steele was born May 31, 1874 in Amherst, Ohio. Omar was a 33rd Degree Mason and the lodge was named the O.N. Steele Masonic Lodge. 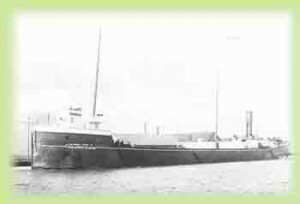 He joined Globe Iron Works which eventually became the American Shipbuilding Company where he was General Superintendent of the Lorain shipyard and he was Chief Engineer on the first iron hulled ore ship on the Great Lakes, the “Onoko”. He died August 17, 1911 in Lakewood, Ohio, and is buried in Lakeside Cemetery in Cleveland. Here is the cemetery website listing for Omar. He was an Engineer for 20 years on the Great Lakes. In 1882, he piloted the first iron ore carrier that was built of iron, called “Onoko”. He was Superintendent of American Shipbuilding at his death. He was known among local Masons as the namesake of O.N. Steele Lodge (now John W. Barkley Lodge). He was very prominent in Masonic circles. He is buried in Riverside Cemetery in Section 22. This may be more information than you were interested in but I love the family history. My husband and I live in North Carolina. We just came home from a dream trip to the California Coast. We followed Hwy 1 from Santa Cruz to Ft. Bragg, trying to hit all the spots the Steeles lived. I have learned even more since I got home. I am collecting everything I can find. Thank you for writing me. I hope sometime you may come across some additional information for me. I have always been frustrated that I can’t find any information on Samuel Horace Steele or Omar in California. I just love exchanging info. Let me know if you or anyone you know has interest in the Ohio part of the family. Most people didn’t even know we existed. This entry was posted in Omar N. Steele, Robin Caldwell, Steele Family and tagged Omar N. Steele. Bookmark the permalink.